By comparison, 39% of voters heard “a lot” about allegations that Saudi officials killed Washington Post columnist Jamal Khashoggi. 53% said passing a bill overhauling the health care system should be top priority; 52% said the same about reducing the deficit. Voters consistently rank addressing the federal budget deficit and overhauling the health care system as their top priorities for Congress, Morning Consult polling shows. But significant developments on those two fronts last week — the Treasury Department’s announcement that the United States recorded a $779 billion deficit for the previous fiscal year and Senate Majority Leader Mitch McConnell’s statement that the GOP could take another crack at repealing Obamacare — were eclipsed by other stories, especially by developments in the disappearance of Washington Post columnist Jamal Khashoggi. A new Morning Consult/Politico poll conducted Oct. 18-19 found 39 percent of registered voters said they had seen, read or heard “a lot” about Turkish government officials’ allegations that Khashoggi was beaten, tortured and murdered by a team of Saudi security agents inside the kingdom’s consulate in Istanbul earlier this month. That’s more than twice the share of registered voters (17 percent) who said they’d heard a lot about the Treasury Department’s announcement that the United States had recorded a $779 billion federal budget deficit for fiscal year 2018, a 17 percent increase from the previous year and the highest figure recorded in six years. The same share of voters reported hearing a lot about McConnell’s disappointment with the GOP’s failed Obamacare repeal effort and leaving open the possibility that Republicans could revive the push if they can add seats in the Senate. The relative lack of awareness of those two policy-focused stories among the 1,968 registered voters polled in the national, online survey comes as the deficit and health care remain the highest priority for the public. Fifty-three percent of registered voters said passing a bill reforming the health care system should be a top priority for Congress, while 52 percent said the same about reducing the federal budget deficit. 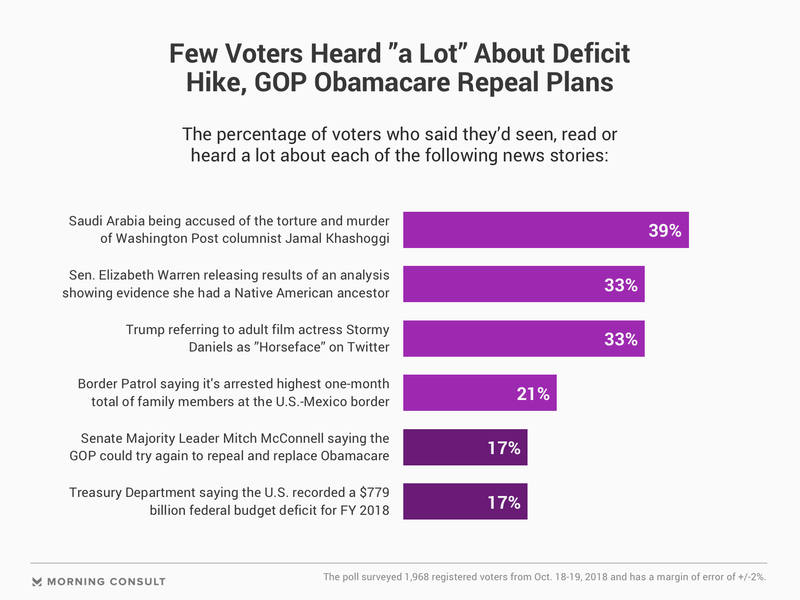 Those emphases were largely unchanged from the previous week’s Morning Consult/Politico poll, when 56 percent said health care reform should be a top priority and 52 percent prioritized reducing the deficit. Both surveys had a 2 percentage-point margin of error.